Posted on Thu, Nov 3, 2011 : 5:58 a.m.
A new study confirms what many college students have known all along: The 'freshman 15' is an exaggeration. The study, conducted by University of Michigan at Dearborn and Ohio State University, says that students don't actually gain a full 15 pounds their first year of college, as rumored. Instead, students gain about three pounds their first year, according to the study. Researchers involved in the project interviewed roughly 7,400 people nationwide over a one-year period. "I don't think I gained much more than seven pounds," recalled U-M junior Andrea Alajebovic. By sophomore year, Alajebovic had learned how to balance a college diet and lost the extra weight. "I did gain weight my freshman year, but it's because of the dorms," she said. Eating "buffet-style, high sodium meals" at campus dorms is the cause of most freshman weight gain, Alajebovic surmised. U-M senior Dustin Eisenstat agreed. "There's definitely a weight gain because it's hard to adjust your diet to college," he said. "But I don't know if there's an exact number." The recently released study, however, disagrees. It says that on average women gain 2.4 pounds their freshman year, while men gain 3.4 pounds. "That’s a lot less than 15 pounds," said U-M Dearborn researcher Pat Smith, who conducted the study. In reality, fewer than 10 percent of students gain 15 pounds or more their freshman year. "All these stories about the freshmen 15 are clearly exaggerations," Smith said. However, young adults in college do gain about half a pound more than young adults who aren't in college, Smith said. The study also found that 25 percent of freshman lost weight their freshman year. Such was the experience of Sara Satin. "I try to avoid eating food in the middle of the night or hitting up the dessert bars," the U-M freshman said. "And there's a little bit of walking during the day." The trek from class to class on the large Ann Arbor campus and access to the school's three gyms are helpful in keeping the weight off, Satin said. 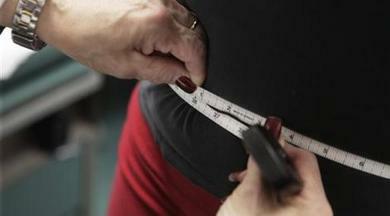 "Everyone worries about it... but people don't gain that much weight usually," she said. "The actual number 15 is exaggerated." Amy Novvab, a U-M junior, said she didn't gain any weight her freshman year, either. She said that often the stress of a college workload leads many freshmen to lose weight. Novvab said that as awareness of obesity grows, so does the number of options in dining halls. "At Michigan, every night there's lots of options, so you can find healthy foods," she said. But Novvab said that self-restraint can be difficult because many college gatherings are "surrounded by food." The study found that once individuals enter adulthood, they steadily gain two or three pounds each year. "Don’t worry about the freshman year, worry every year about not gaining too much weight," Smith warned. "It could sneak up on you." Last year, a U-M study determined that freshman weight gain was directly correlated to the weight of a student's roommate. Additionally, U-M's gradual switch to trayless dining halls may help curb weight gain. Thu, Nov 3, 2011 : 9:40 p.m.
&quot;Last year, a U-M study determined that freshman weight gain was directly correlated to the weight of a student's roommate.&quot; This sentence should read &quot;inversely related&quot; -- &quot;directly correlated&quot; means the heavier one's roommate, the more weight the subject would gain. Thu, Nov 3, 2011 : 2:42 p.m. I think this study needs to take starting weight into account. If you're a tubbo before you come to college because you eat all kinds of junk, and then you start eating the marginally healthier food served in the dorm cafeteria, you're probably going to lose weight, especially if you couple that with all the walking students usually do on campus. So the average weight gain is going to go down, because the heftier students are going to lose weight, while the slimmer ones are likely to gain it. Thu, Nov 3, 2011 : 3:54 p.m. In my day we didn't have these so-called internets. We had to walk to class5 days a week! Well, ok, 4. Maybe 3. Whichever days we weren't too hung over to get out of bed, anyway. Thu, Nov 3, 2011 : 3:39 p.m. Kids these days don't walk to class what with their internets and twitters delivering content directly to them. So there's that. Thu, Nov 3, 2011 : 2:37 p.m.
...Of course there has always been the Freshman 15.... Don't need a study to see that one. One difference from the old days to now is that many freshman have grown up living a 'freshman' lifestyle before they arrived on campus. Not much excersise due to video games and poor nutrition. It's not a shock to their system entering freshman year and they can't put much more weight on that they don't already have. Thu, Nov 3, 2011 : 2:11 p.m.
Eat lots of industrial food-like products loaded with omega-6 refined seed oils and grains and you'll get fat. Eat pastured meat, veggies and healthy fats (animal, olive oil, coconut oil) that your body knows what to do with and you'll do well. Unfortunately proper food doesn't get federal subsidies like grains do so paying for it on a student budget can be tricky, even if you've figured out that federal nutrition guidelines are a crock. At the very least cut out soft drinks (all of them!) and you'll be ahead of the game. Unfortunately I didn't learn any of this until long after graduation. Freshman 15? At least. Thu, Nov 3, 2011 : 1:43 p.m. It sounds like this study is just a snap shot of the current generation of students. The &quot;freshman 5/10/15&quot; stories are passed down from student to student over many years, and may date from years when students did gain more weight than they do now. When I was a student, I viewed the Freshman 10 not as a universal &quot;truth&quot; but rather as a warning of what could happen to you if you were not aware of what you were eating and how your body was responding. Thu, Nov 3, 2011 : 12:59 p.m.
We are a fat society. Once we hit 18 and our metabolism slows down we gain weight. Face it kids, this is your destiny! How will Obamacare fix this?!?!? Thu, Nov 3, 2011 : 12:55 p.m. This article's using average data, so of course it's going to show that not everyone gains 15, but it was pretty obvious to me during my college years that a fair number of freshmen do actually gain the &quot;Freshman 15&quot;. No quantitative data here, just qualitative observation. Of course, then there are always the freaks of nature like me who manage to lose 15 during that first year while eating 1-2 full trays of food every meal. That still boggles my mind. Thu, Nov 3, 2011 : 12:39 p.m. True, high-sodium meals don't help... but neither does lots of beer. Thu, Nov 3, 2011 : 10:47 a.m.
i find the &quot;article&quot; hilarious. I have never heard of the Freshman 15. I have heard of the freshman 5 and freshman 10 and it has been in the context of not everyone - just a few get busted by it. Thu, Nov 3, 2011 : 10:44 a.m. I'd love to see a study showing that going trayless results in weight reduction. What a crock (pun, and typo, intended). Sun, Nov 6, 2011 : 3:14 a.m.
smaller plateas as well as smaller trays actually works! Thu, Nov 3, 2011 : 9:49 p.m.